During the Devonian, warm shallow seas covered northwestern New Jersey. 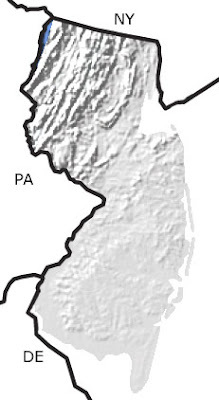 Brachiopods, bryozoans, corals, crinoids, and trilobites are common fossils found in the Devonian rocks of the upper Delaware River valley in northwestern Warren and Sussex Counties. North American Paleogeography: Most of North America was covered by a shallow sea throughout the Devonian, although some small landmasses were exposed around the continent. 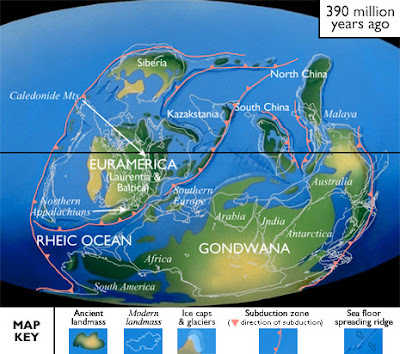 On its southern margin (now the East Coast), the collision with Avalonia begun in the Late Silurian continued into the Devonian and produced an extensive chain of mountains. The rivers that drained these mountains deposited abundant sand and mud over parts of present-day Canada and the Northeast from Maine to Tennessee.